Why settle for being an aristocrat when you can be king? But what if I told you there's something even better? There is. It's time to bend the knee and swear allegiance to the Dividend Kings. 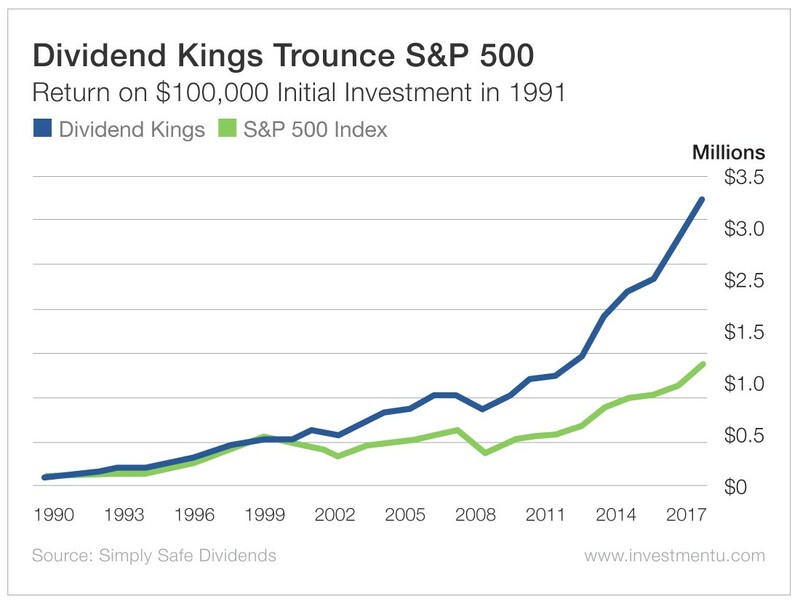 While Dividend Aristocrats have raised their dividends for 25 years in a row, Dividend Kings have raised their dividends for 50. There are more than 50 Dividend Aristocrats, but there are fewer than 30 Dividend Kings. They consist of the most powerful and successful companies in the world. Dividend Kings are beyond household names... They're cultural icons. Coca-Cola (NYSE: KO) is one of the highest-yielding Dividend Kings, paying 3.4%. Colgate-Palmolive (NYSE: CL) and Stanley Black & Decker (NYSE: SWK) are also among the Kings, yielding 2.6% and 2%, respectively. If you invested $100,000 into the S&P 500 in 1991, it would be worth $1.4 million today. That same amount spread among the Dividend Kings in 1991 would be worth $3.2 million today. That's 81% higher than a generic S&P 500 investment. A good dividend portfolio will trounce the market. Dividend-paying stocks tend to be less volatile than the stock market at large. Cutting dividends can shake investor confidence and cause share prices to plummet. As a result, most companies will avoid cutting dividends at all costs, including during recessions. That means your money will continue to grow even in the face of a market crash. The Dividend Kings have weathered every recession and bear market since at least 1969, and some of them go back even further. Not only have they survived, but they've all raised their dividends during those recessions. An investment in the Dividend Kings will grow year after year, regardless of market trends, as you continue to reinvest the growing dividends. Chief Income Strategist Marc Lichtenfeld could be considered something of a Dividend King himself. His dividend strategy and portfolios have consistently destroyed the S&P 500, and his award-winning book Get Rich With Dividends: A Proven System for Double Digit Returns is a best-seller. Dividend investing is a powerful weapon in an investor's arsenal. It allows you to create a money machine.